I read this novel in England this summer; I’ve been on a bit of an Amis kick, filling in missing volumes while I mull over the overall effect of this pursuit. Projects tends to develop this way; I get obsessed about something, immerse myself in it, then when the time is right, chuck it all away and write. I’m also knee-deep in Angela Carter, so I can’t really explain how they intertwine (could two people be less likely to intertwine?). 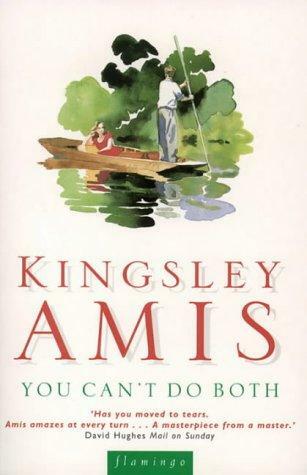 You Can’t Do Both tells the story of Robin Davies, who lives in a south London suburb, winds up going to Oxford and then the Second World War and eventually into the adventure that is marriage, though not on purpose. Davies’ father is a weird amalgamation of strident atheism and puritanical control. His mother offers a sometime refuge against his father’s rigidity, but without much substantial help. When at last he’s freed of his stifling suburban home, he tries to live up to his fevered sexual dreams but encounters the realities of women who are likewise a bundle of eagerness, confusion and contradictions. Amis plays this for some wonderful laughs, no surprise. But he also carefully details the way that the misogynist tendencies develop from these encounters. Women are denying him the one thing he must have. As Richard Bradford suggests in Lucky Him, this novel comes much closer to the truth of Amis’ life than his memoirs, a highly fanciful selection of events and memories. There is a sensitive and moving depiction of a friend of Robin’s who turns out to be gay which makes plain the costs and dangers of that identity in the not so distant past. You’ll also find an evocation of what the Oxford days with Larkin might have been like and the awkward development of his first marriage, grown out of an uncertain alliance that quickly developed into habit because of the sexual connection, then threatened by pregnancy. Davies never ends up being likeable exactly; by the end, he’s distinctly unlikeable. But the dissection is fascinating and if not really an apology, it does seem to offer a bit of an explanation for how Amis became what he was. And at his best, that was a lot. See the round-up of other neglected tomes over at Patti Abbott’s blog.